China is the largest auto market in the world and is currently putting together a detailed plan that would ban the manufacturing and sale of vehicles that are powered just by fossil fuels, said officials on Monday. The government of China is following the lead of other countries such as Britain, France, India and Norway that have already made announcements of their plans to ban gas and diesel vehicles in favor of those that are cleaner in the upcoming years. Regulators have not yet decided when the ban in China would go into effect, but work has started on making a timetable according to Xin Guobin the vice minister of industry in China. He has warned car makers that they must adjust their own strategies to this changing situation, said Xinhua the Chinese state-owned news agency. Authorities will be offering subsidies of up to 50% of the retail prices for electric as well as some hybrid vehicles as a way to help boost production, reported the news agency. These subsidies are positive news for the makers of electric cars. Dozens of different models already are available in the second largest economy in the world. International carmakers such as Volkswagen and Ford are looking to develop a line of fully electric vehicles in China, while GM is already selling the Bolt a fully electric vehicle in the U.S. and Baojun 100 a tiny vehicle in China. The market in China is dominated already by the industry’s domestic manufacturers such as BYD and BAIC, which have pursued in a very aggressive manner the electric vehicle business. Shares of BYD were up 4.6% in Monday trading in Hong Kong following the comments by officials in China about the possible ban of gas and diesel cars released during the weekend. Volvo, which is Chinese owned, announced during July that each of its cars made beginning in 2019 and forward would have electric motors. China, plagued with air pollution, has been quick to adopt the new technology. In 2016, China represented over 40% of the more than 750,000 electric vehicles that were sold globally. That is over twice the number as sold in the U.S. However, while the electric car sales are rapidly increasingly in China, it remains a market that is overwhelming dominated by gas and diesel vehicles. 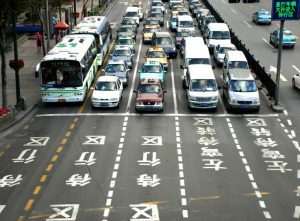 Of the close to 28 million vehicles sold last year in China, about 1% were electric.